The Echo reports the Treasurer is now going into the dark territory of threatening to cut GST allocations to the states if the states don’t play the fracking game. Gasfield Free Northern Rivers campaigners have hit back at a threat from treasurer Scott Morrison to cut the GST distribution for state and territory governments if they push back against unconventional gas exploration, known as fracking. Mr Morrison has warned state governments the Productivity Commission will be considering its attitude towards the controversial gas extraction industry – particularly any moratoriums or limits on the practice – in its review of the goods and services tax distribution. ‘This is a direct threat to the Northern Rivers,’ Annie Kia for Gasfield Free Northern Rivers said. Peter Nielsen, a farmer from Bentley and a National Party member said, ‘We all know there is no gas shortage’. ‘The problem is it’s all being exported overseas forcing our prices up and creating a domestic shortage. Bentley resident Rosemary Joseph said she was ‘gobsmacked’. 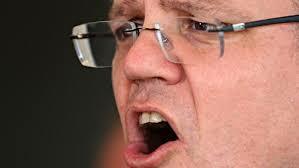 ‘It’s like Scott Morrison has found his inner Putin. I can’t believe the Treasurer said this, and that the Coalition has allowed him to say this. We call on Federal representative and National Party member Kevin Hogan to speak out against this new extortion approach to GST allocation’.